Geography/Culture: Celtic [?]. Dutch. A temple of Hers was found at Domburg [near Amsterdam] in 1647. She had a shrine on the Island of Walcheren on the Dutch coast. In 1970-71, some 125 altars and statues dedicated to Her were recovered from the sea, near Colijnsplaat. 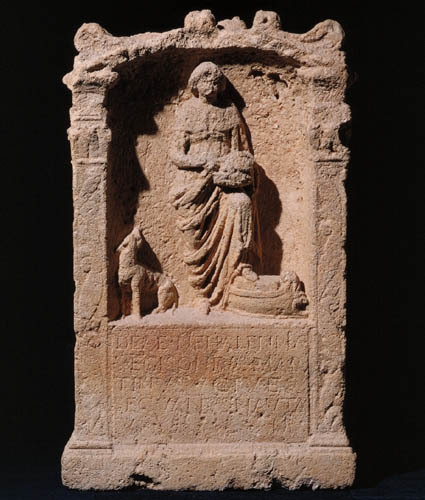 Description: Goddess of fertility, perhaps of plenty, perhaps of hunting, but especially of Domburg, the holy place where starts the journey of the souls of the dead across the sea to the Western Isle of the Blessed; Protectress and perhaps Guide of the souls on their great journey home; Matroness of overseas trade, and Protectress of living sea-traders and seamen; Giver of safe-passage to those who invoke Her. Nothing is known of Her from classical literature. Nothing is certain about this description. To whom are sacred: dog (which accompanies Her in nearly all of Her representations, generally symbolizes death); palm-tree; acanthus leaves; cornucopia; basket of fruits, perhaps apples (apples are, in Old Norse and Irish tradition the symbol of renewed youth); a ship is frequently shown beside Her (it's possible She has some connection with ship burial, but the ship may also be an allusion to prosperous voyaging); a vela, `curtain', displayed [presumably sculpted in low relief] on the back of some Nehelanniaen altars (on the meaning of the vela no agreement exists, it may be decorative, it may suggest the veiled future); the Garden of the Hesperides is sometimes represented pictorially on the altar sides, as are palm-trees, acanthus leaves and cornucopia). Male associates: some altars show figures of Neptune and Hercules. [Presumably these would not be the names by which the gods were known to the people who dedicated the altars, nor to those who made them]. It is suggested She may be identified with Epona. Her fruit basket and the cornucopia connect Her to the Deae-Matres. Two statues of Victory, qv Victoria, have also been found at Domburg.